Eclectic Paperie: A lil' paint & bling can make a difference! 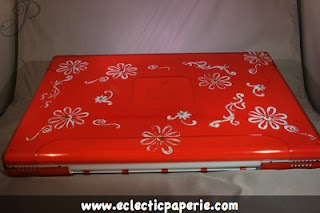 It's fun to be able to use some of your paints and embellishments to add a little fun to something like your computer. My husband is an Apple fanatic (www.macsparky.com) so he finally converted me. I have high hopes that this new MacBook will serve all of eP nation more efficiently and not crash, too. I saw this cool plastic cover at the Apple store and just thought that it would like much better with a some painted daisies and some bling. Using my Fancy Pants Bella Brush and Dabber paint(Snow Cap) was easy. 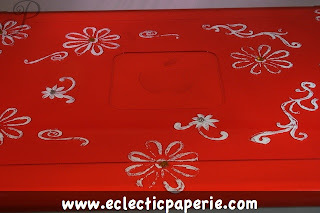 Acrylic stamps make it easy to stamp any surface. Then I added some of the Adorn-it Jewels for the middle and voila! Now it's easy to find and spot where my computer is. Gives it some character. OMGoodness, what a cute idea to customize your 'puter! You girls rock! Well look at this! Aren't you just over-the-top clever!! Woooooohhhoooooooooooooooo!! It looks great ... but no Daisy's on my Mac .. okay?